Last week, I got stuck at JFK for two days during the Christmas Snow Blizzard here. My family and I were to leave the day after Christmas for a week long vacation in the Bahamas. We arrived at noon in plenty of time for our afternoon flight. We tried even to get on a slightly earlier plane if there were seats. Well, our 3:40 flight was repeatedly delayed. The snow started to come down at 1pm and gradually was covering the airport. Jet Blue insisted that our flight was going to take off. They had the pilot and co-pilot; they just needed the flight attendants. 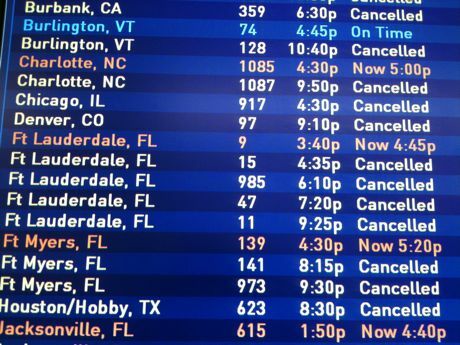 As other flights around us were canceling, Jet Blue continued to insist that our flight was going. Five hours later at 8:30pm, they cancelled it. You can imagine the chaos. Since ours was one of the last to cancel, we were one of the last on line to try and get help re-booking. I also had two cell phones repeatedly dialing the airline Help line. Jet Blue’s website was totally overwhelmed and crashing every time you tried to “manage” your flight and re-book. Joe Sharkey in Tuesday’s NY Times wrote that “airline Web sites, which are quite good at taking a reservation, are not so good ÔÇö in a crisis ÔÇö at keeping it.” It was a mess. We went to get our luggage to discover that it was sent ahead to our destination. So now we were in a Blizzard with only summer clothes on our backs. I had earlier made a reservation at the Airport Sheraton. (I am in production, you know, plan ahead). But how to get to the hotel? The city had shut down the Airtrain that circles the airport. No cabs were around. The Hotel shuttle was only coming to an area called Federal Circle that the Airtrain would have normally let you off on. Rumors were circulating that there was an airport bus that took people around. There was one but only one every hour. We got on the second one to come around and rode along feeling like we were in a third world country with people sitting up in the luggage racks and hanging out the doors. We arrived at Federal Circle about midnight and waited about two hours for the hotel bus to make it through. We contemplated walking the two miles to the hotel but with 50 mile an hour blinding snow, I was afraid we would end up as a horrible headline on tomorrow’s paper. We finally got the the hotel at 2AM. The next day was bizarre. We woke up to the sea of snow outside our windows and the Jet Blue website telling us all flights were canceled for the day. After an hour on hold with the telephone hotline I was told by a Jet Blue rep that we were on the stand by list for tomorrow (the next confirmed seat was Jan 3!) So we spend the day eating in the room and watching movies. Tuesday (Day 2) arrived and with it huge lines at the airport with people trying to get on flights out of town. (We thought about driving to Washington or Philly but all rental cars were gone). We got to the gate of the first flight out only to be told that we were now low on the list (contrary to what the phone rep said). Several flights took off without us making the standby list. It’s was exhausting because there appeared to be no system. They would just start calling names and if you were not right there, you got bumped. With gates changing constantly and some flights being delayed it was a gamble as to which southbound airplane we should stake our standby status at. So with one ear on the announcements and one eye on the gates, we spent the day trying to get a flight. My wife and I gave ourselves a 4pm cut-off time for getting boarding passes for a flight or we would just go home and scrap the vacation. With no cabs and no Airtrain, the only way out of the airport was by these planes or a car service. So I had a car service arranged to stand by for us whether we flew or not. At 4pm, one of the gate agents told us we had a fairly good chance to get on the next one. So with that in mind, we held out until 7pm when we got on the flight and flew first to Florida. Now in Florida, we had to wait another day to get a flight to Bahamas. That flight was confirmed. We were not flying stand-by again! So we spent that day at the beach pretending it was warm (it was sunny). The kids had to be back in school the following week so we could not extend our stay but we were rewarded with four wonderfully warm and very sunny days in the Bahamas.